High above the Conwy Valley is the village of Capel Garmon, near Betws-y-Coed. 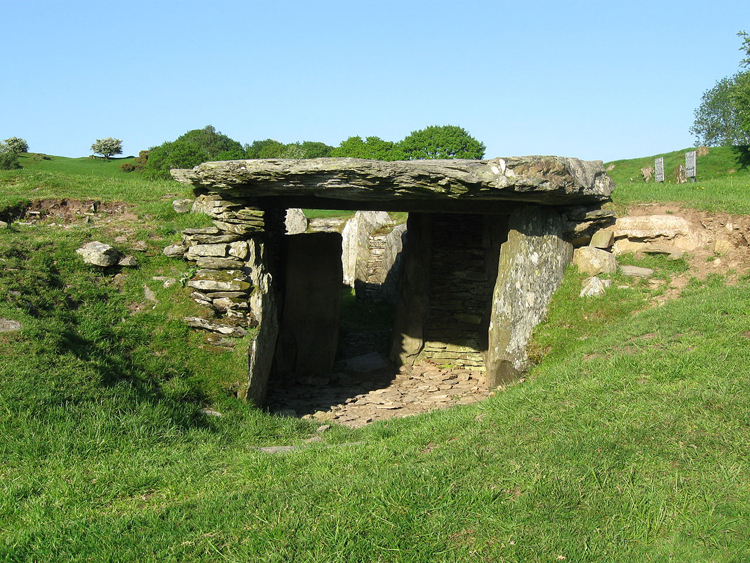 Nearby, in a farmer’s field, is the Neolithic burial chamber (3rd century BC) which consists of a passage leading to a rectangular space with circular chambers branching off to the east and west. The tomb was used as a stable in the nineteenth century and has undergone considerable ‘renovation’. However, Beaker pottery was found in the chamber and a fire dog (an iron bracket support for a fire to help it burn better) that is now in the National Museum of Wales in Cardiff. What is great here is the immense capstone still in place and the wonderful views of Snowdonia that are breath-taking. There are some lovely photographs of the chamber on the walesdirectorg.co.uk site. In ‘The Modern Antiquarian’ Julian Cope opens up an interesting argument about the history of our attitude to such sites; how we often in the past have ignored surrounding stones and have definitely not lifted our eyes to the horizon to see the surrounding alignments. Cope argues that nowhere is this more obvious than at Capel Garmon. His essays in his Antiquarian are so important that even Julian’s rhapsodic prose in the introduction: ‘this book aims to give something back to the culturally dispossessed of Britain, be they white, black or green; Welsh, English or In-between’ doesn’t say the half of it.